1More than 6 million Syrians are internally displaced within their own country, accounting for about half (49%) of all displaced Syrians worldwide. This number has remained little changed in recent years, as hundreds of thousands of Syrians have returned to their homes and slightly higher numbers have become newly displaced, according to midyear 2017 population estimates from the Internal Displacement Monitoring Centre (IDMC). In the first half of 2017, for example, nearly 700,000 Syrians were newly displaced within the country due to the ongoing conflict. 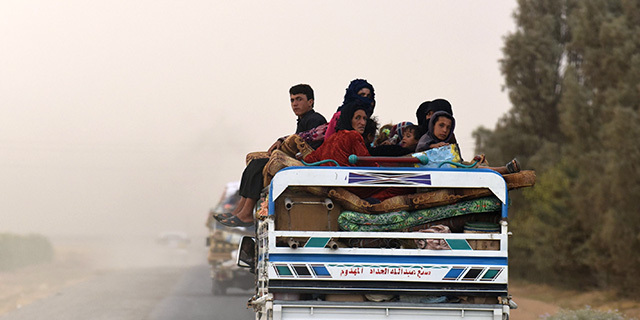 2More than 5 million displaced Syrians live in neighboring countries in the Middle East and North Africa. Those in Turkey (3.4 million), Lebanon (1 million), Jordan (660,000) and Iraq (250,000) account for about four-in-ten Syrians displaced around the world (41%), according to estimates based on data from the United Nations High Commissioner for Refugees (UNHCR). More than 150,000 Syrians also live in North African countries like Egypt and Libya. The number of Syrians living in these countries surged in 2014, from 500,000 to 2.5 million, largely due to a sharp increase in Syrian refugees to Jordan and Lebanon. Turkey also experienced a large increase in both 2014 (from about 560,000 at the start of the year to 1.6 million at the end) and 2015 (from 1.6 million to 2.5 million by year’s end). 3About 1 million displaced Syrians have moved to Europe as asylum seekers or refugees since the conflict began, according to asylum seeker data from Eurostat, Europe’s statistical agency, and UNHCR data on refugee resettlement. More than 500,000 Syrians moved to Germany and applied for asylum between 2011 and 2017, making it the fifth-largest displaced Syrian population in the world. Smaller numbers of Syrian asylum seekers moved to Sweden (more than 110,000) and Austria (nearly 50,000). Nearly all Syrian applicants who applied for asylum in Europe in 2015 and 2016 either were approved to stay or were waiting for a decision, according to Pew Research Center estimates. In the U.S., about 8,000 Syrians have Temporary Protected Status (TPS) through a federal program that provides some immigrants with time-limited permission to live and work in the U.S. because of war or other catastrophes in their home countries. TPS protection for these Syrians is set to expire on March 31; a decision on their future is expected by the end of January.